In type 1 diabetes the body’s immune system kills of the insulin producing cells leaving the pancreas unable to produce enough insulin to keep blood glucose levels at healthy levels. As a result, insulin needs to be taken by injection or another delivery means such as by infusion with an insulin pump. Insulin is a hormone in the body that helps to move glucose out of the blood and into cells for energy. Your diabetes health team are an important part of your diabetes treatment. Your GP and consultants, between them, will be able to offer you advice on controlling diabetes and refer you to any medical specialists you may need to see. Your health team will also be responsible for making sure you get all the diabetes health checks that are recommended for people with diabetes. The health checks will help you health team to spot any signs of damage caused by diabetes and ensure these are treated to prevent the damage becoming more serious. When you are diagnosed with type 1 diabetes you will be put onto insulin injections. The thought of injecting each day can be a big shock at first but once you get the hang of it, it becomes a manageable part of life. Over the last few decades some big steps have been made to reduce the hassle involved in injecting and insulin injections can now be done quickly, discretely and often painlessly. An alternative way of taking insulin is to use an insulin pump. An alternative name for insulin pump therapy is continuous insulin infusion therapy because insulin pumps work by continuously delivering small amounts of insulin into the body. Insulin pumps have a small tube called a cannula that is inserted just under the skin and is kept in place for a few days at a time until they need changing. The cannula allows insulin to be delivered into the layer of fat we have just under the skin, from where it can be absorbed by the blood. The insulin pump itself is worn outside of the body, often near to your waist, and electronic controls on the pump or a separate handheld device allow you to control how much insulin is delivered. 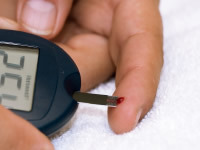 As mentioned above, key to treating type 1 diabetes is to ensure blood glucose levels are not too high and not too low. There are specific blood glucose targets that we should aim to keep our blood glucose levels within. The balancing act of keeping sugar levels not too high and not too low is not easy but with a good understanding of how our body works and how diabetes behaves, you can build up experience to gain good control of type 1 diabetes. Everyone with type 1 diabetes will experience some blood sugar levels that are too high or too low at some point. If our blood glucose levels become either very high or very low, it can put up us at risk of immediate dangerous health so it is important to know how to recognise the signs of high and low blood glucose levels. Another reason for keeping sugar levels at the recommended levels is that regularly having blood glucose levels that are too high raises the risk of suffering health difficulties (diabetes complications) later in life. When you are diagnosed with type 1 diabetes, your body will often be producing a significant amount of its own insulin which means your pancreas helps out to make managing sugar levels slightly easier. The time period when your body is producing a useful amount of insulin is known as the honeymoon phase of type 1 diabetes. After a number of months and sometimes up to a few years, your body will stop being able to produce as much insulin and you will find you need to take more insulin than you have been. When this happens you may also find that your blood glucose results may become higher or sometimes lower than previously. If you ever find that your diabetes has become more difficult to manage than previously, speak to your health team who will be able to find time to advise you on how you can best cope with managing your sugar levels. Blood glucose monitoring, also known as blood glucose testing, is an important part of type 1 diabetes and we need to test our blood sugar levels at least a few times each day in order to control our blood sugar levels and reduce the chance of having dangerously high or low sugar levels. Blood glucose testing involves pricking fingers to take a sample of blood. It can be painful but, like with injecting, it does get easier over time. Many of us don’t like testing blood sugar levels through the day but the benefits of testing is that it helps us to avoid unpleasant high and low sugar levels which can make us tired and uncomfortable as well as being potentially dangerous in the short and long term. Regularly getting high or low sugar levels can become demoralising but it is important to not let that put you off. If you respond to high or low levels by testing slightly more often and spending a bit of extra time thinking why you might be high or low each time, then after a few days or so, you will start to get more understanding and confidence in managing your diabetes. Put simply, setbacks can be overcome in the longer term with a bit of dedication. Whilst insulin helps to lower sugar levels by allow cells to take in glucose from the blood, the food we eat raises sugar levels. When we eat, carbohydrate in food gets broken down into glucose during digestion and gets absorbed into the blood stream. Our diet therefore plays a significant role in the control of our blood sugar levels. Because the carbohydrate in food raises blood sugar levels, it is important that we balance the amount of insulin we take at meals in proportion with the amount of carbohydrate we eat. Carbohydrate counting and insulin dose adjustment are key skills to learn in order to best control type 1 diabetes. Learning to balance carbohydrate intake takes a combination of knowledge and experience. One of the best ways to learn how to count carbohydrate and adjust insulin doses is to go on a carbohydrate counting course. If you have type 1 diabetes and have not been on a carbohydrate counting course, or need a refresher course, ask your GP whether he or she will be able to refer you onto a course. One popular type of carbohydrate counting courses is called DAFNE which stands for dose adjustment for normal eating. Another form of treating type 1 diabetes is to have an injection of insulin producing cells. This procedure, known as islet cell transplantation, allows the transplanted insulin producing islet cells to produce insulin inside your body. Islet cell transplantation can help to reduce the amount of insulin you need to take and can make managing your diabetes easier but it is an expensive procedure and has drawbacks as well. For these reasons, islet cell transplants are only given to a small number of people each year. Preference is given to people that experience severe hypoglycemia on a regular basis.